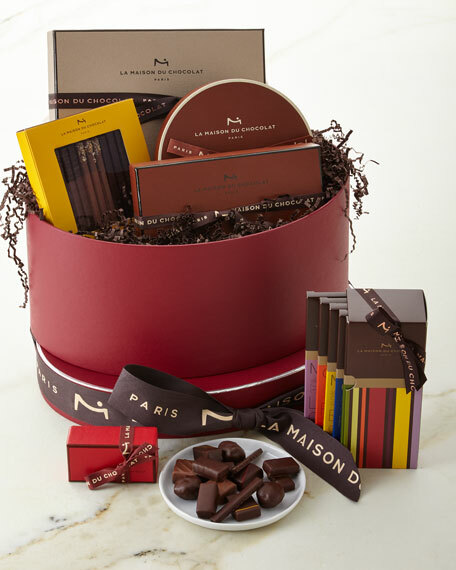 Hatbox filled with an exquisite collection of celebrated chocolate assortments. Gift box filled with Fine Champagne Cognac truffles. Box of orangettes: long strips of rind slowly candied for two weeks. Supple and translucent, with the essence of fruit and liberated from the excess of sugar, they are delicately enrobed in a fine layer of dark chocolate. Coffret Maison assorted chocolate box: Elegance and refinement define this exceptional gift box presenting a large selection of ganaches and pralinés in dark and milk chocolate, and luscious plain dark chocolate truffles. Elegant round gift box of 20 Rochers, milk and dark chocolate pralinés. Cuana: 74% cocoa, intense and robust dark chocolate bar. Akosombo: 68% cocoa, dark chocolate bar intense with notes of roasted coffee. Orinoco: 60% cocoa, round and floral dark chocolate bar. Marao: 60% cocoa, associating the intensity of dark chocolate and the sweetness of almonds. Monsera: 37% cocoa, milk chocolate bar with pronounced notes of cacao. Gift box of nine whipped praliné twigs, available in three exquisite recipes. Dark chocolate praliné crêpe dentelle (three pieces): pure whipped hazelnut praliné with silvers of crispy crêpes enrobed in dark chocolate. Dark chocolate praliné caramelized biscuit (three pieces): whipped praliné with almonds and hazelnuts with slivers of caramelized biscuits, enrobed in dark chocolate. Milk chocolate praliné roasted coconut (three pieces): whipped almond praliné with roasted, caramelized grated coconut, enrobed in milk chocolate. 13.2"W x 10"D x 5.9"T.
Allergen Information: Contains dairy, soy, and tree nuts. May contain traces of nuts, milk and egg proteins, gluten and peanut.